Someone this morning posted on Facebook ‘The 22 Most Brilliant Life Hacks Every Human Being Needs to Know” but it wasn’t the title that captured my attention, it was the picture that came along with it. 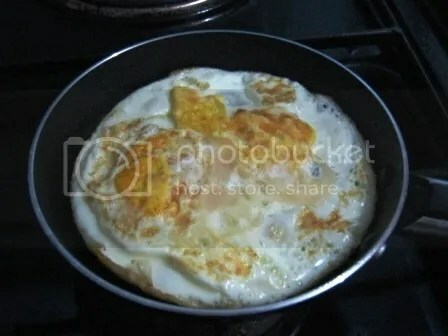 Back in 2008 while waiting for Marcus and while waiting for an employer to get me out of bumhood, I had all the time to try my luck in cooking my own perfect sunny side up. So when I saw this I got excited (nope, I’m not saying it as egg-cited). Today would have been the best opportunity for me to try this hack as Marcus was left under my mercy–wifey went to Batangas after breakfast–but I soon realized that I need a big onion as shown. So as I have imagined our day, kiddo and I ended up eating my own version of corned beef omelet for lunch which he enjoyed anyway. Days ago, out of nowhere Marcus asked me while on our way home from school, “Daddy, why can’t you cook?” Ti abi. Today must be a good a day. I started with a hearty breakfast of pancake (courtesy of wifey) paired with a hot instant coffee. It's leaning, it's oily...it's delicious. As if there’s one coffee god watching while we ate and who finds it pathetic that it could have been made better with a good brewed coffee, he sent over someone from the courier company, LBC. 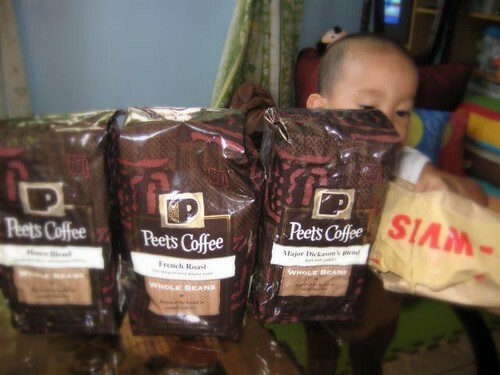 The delivery man handed on to me not 1 but 3 packs of Peets coffee from Vegas (via Bacolod). Wow, isn’t that great? "Dad, the package looks familiar but the brand doesn't." "Can I have this one tomorrow instead of my boring formula?" Pure caffeine pleasure days are here again. Hahaha. Thanks again Keren. 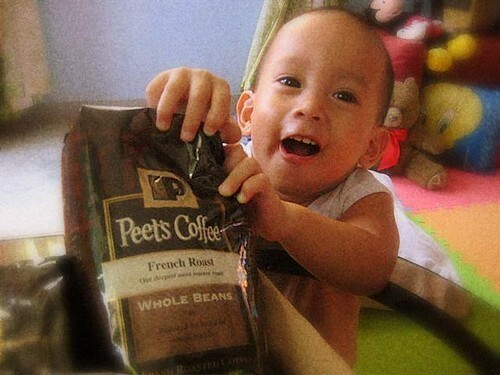 The package was sent via my cousin’s friend (who also got some of this Peets) who is in Bacolod. I soon learned that he’s an elder brother of a schoolmate back in high school. Small world, huh. Just a couple of hours after the sun beams peaked out of the clouds and I’m declaring my day complete already. Why? Because I just had a great breakfast courtesy of wifey. It’s been a whole week of patiently waiting for this moment and today she did it again. Although, wifey is not known to be a morning person and often times I’d give her a couple of minutes to move after I purposely jump out of bed to wake her up. But she must have some Garfield blood that makes her stuck unto the pillows despite any disturbance and even if the sun beams penetrate the curtains. But it was with the pledge, “for better or for worse” (I always keep that in mind) that I learned to adapt to it somehow – or still trying to. The good think though about this seemingly act of hibernation during her day-offs is that it enables her to store energy to cook and a very good one at that. She’s like a wind-up toy that once released goes on and on (well, sounds more like the energizer bunny) until its kinetic energy is spent up ready for another winding. Olives omelet by wifey. Cheap yet tastes nice. “You have to know what you want when you reach the end of the line…” – Andrew Zimmern, Bizarre Foods host. I’m one of those who consider breakfast as the most important meal of the day. I can skip lunch, dinner and whatever snack there is, but never breakfast. I don’t know if this is a common occurrence, but I become grouchy most of the time I miss it. I just realize that this may be the reason why I’m one grumpy driver on my way to work and becomes grumpier when I learn that the sweet scent of a good breakfast I smell at the parking lot is after all foods comparable to a piece of cr*p (pardon the word) once I reach the canteen. So what is it with breakfast that makes me crave for it everyday? Well for me a typical breakfast always includes coffee and egg. 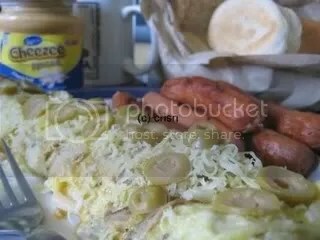 Then these two may be combined with longganisa (sausage), hotdog, tocino, corned beef and spam, just to name a few…a few of the oily ones. Sometimes fish and veggies are preferred although I consider these two as a need-to-have just due to health reasons. If only my taste had to be followed, fish and veggies won’t be any near my breakfast menu. As weird as it may seem, I enjoy watching movies that has scenes of people having breakfast whether in their own home or inside a restaurant – be it a local or a Hollywood film. And to make it even weirder, one of the scenes I won’t skip in my favorite movie Ronin is the part wherein one of the assassins cooks egg for the group. It’s either I’m enjoying the car chase and gun exchanges or just the thought of having great sunny side up with some assassins. 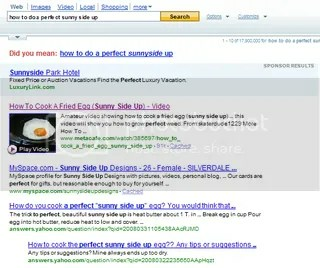 You see I have a fascination with perfectly cooked sunny side up eggs. 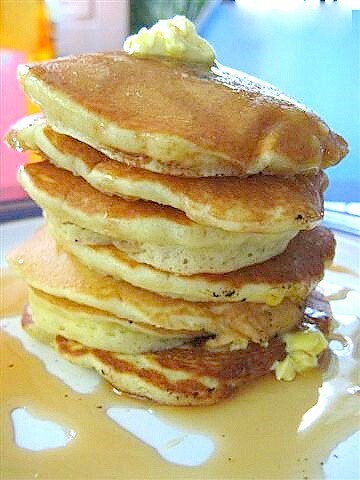 I can’t exactly recall how long I’ve been into this (obsession) but I know that it has been years since I started trying to mimic the well rounded sunny side ups of McDonalds (or Jollibee). I’ve been stubborn enough though to admit that this perfect egg can’t be done without the help of an egg ring or any other things to attain its shape. 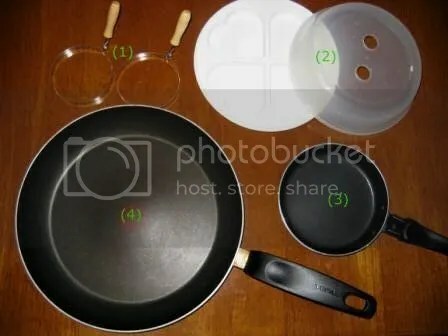 Teflon frying pan – failed. I’ve tested varying stove settings to see if the egg will cook differently, but to no avail. Microwaveable egg cooker which shows on its box 4 heart-shaped (it’s not rounded but as long as it’s perfect, I will go for it) sunny side ups – this one not only failed to meet the promised result, but the egg tasted bland and feels like rubber. One day, I chanced upon a couple of egg rings in the grocery store and at that moment it looked to me like a foolproof way to finally have breakfast with a McDonalds-like egg. Right after I break the egg though, all hope was gone when the egg white leaked like water from the sides. 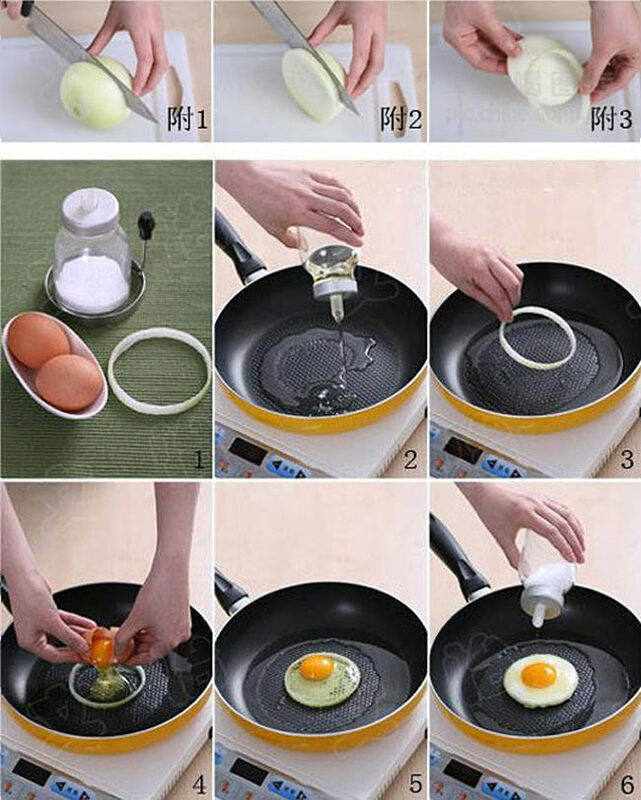 A smaller Teflon frying pan was my last purchase hoping that its size will make the egg form perfectly. It did but the top side does not cook well and it led me to flip it in the end which destroyed the form as a result. With those above mentioned methods or tools, all of which I consider a failure, I’m continuing my search for a promising sunny side up and hoping that someday I’ll start my day with a lovely egg I could proudly say I personally cooked to complement the brewed coffee and other breakfast menu that goes along with it. Hopefully that day will come before we welcome another tiny family member at home…else I’ll be forced to serve either scrambled or boiled eggs to this small guy – ‘coz father can’t cook sunny side up? Hahaha. Just right after I finish this blog, I suddenly remember why I haven’t checked the internet if someone is as desperate as me. 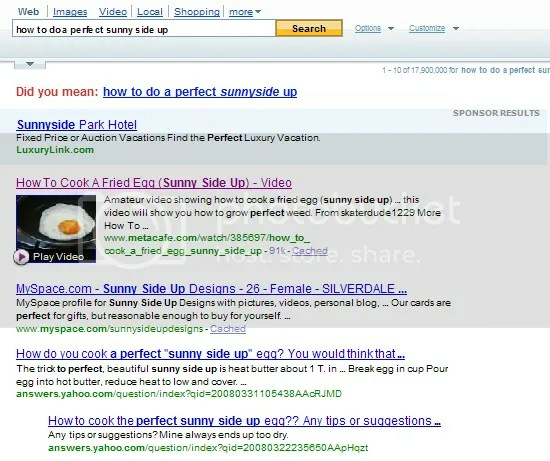 Well, I guess I may not be alone after all as I discovered this after typing: how to do a perfect sunny side up. Anybody want an egg meet? I’m one of those who consider breakfast as the most important meal of the day. I can skip lunch, dinner and whatever snack there is, but never breakfast. I become grouchy when I miss it in the morning. This is often why I’m grumpy on my way to the office and becomes grumpier upon reaching our canteen once I discover that the menu at the counter doesn’t stand true to the enticing smell reaching our company’s parking lot. So what is it with breakfast that makes me crave for it every day? Well, a typical breakfast for me includes coffee and egg. These two may be combined with longganisa (sausage), hotdog, tocino, corned beef, and spam, just to name a few—a few oily ones. Sometimes fish and veggies are accepted for health reasons but if I can avoid it they won’t get near my breakfast selection. As weird as it may seem, I enjoy watching movies that have scenes of people having breakfast either in their own home or inside a restaurant. And to make it even weirder, other than the great car chase and firefight, one of the scenes I won’t skip in Ronin is the part where one of the assassins cooks egg as the others plan their heist. You see I have this thing for perfectly cooked sunny side up eggs. I can’t exactly recall how long I’ve been into this obsession but I know that it has been years since I started trying to mimic the well-rounded sunny side up of McDonalds (or Jollibee). And to prove how serious I am with what others would consider a trivial part of breakfast, I’ve spent time and money, fortunately not a fortune yet, on my quest to perfect my own sunny side up which led me to buy and test ‘tools’ to achieve my ultimate goal. I started of course with the promising Teflon frying pan. It is flat it is non-stick, but it doesn’t work. I’ve used different stove settings to see if the egg will cook differently, yet to no avail. The shape just doesn’t stay round. Then I found the microwaveable egg cooker. This product’s box shows four heart-shaped (it’s not round but as long as it’s perfect I will go for it) sunny side ups. Sadly, the item not only failed to meet the promised result, but the egg tasted bland and felt like rubber after coming out of the microwave. I also tried poaching with the expectation that once I drop the egg into boiling water, it will miraculously attain the coveted shape as I have seen the chefs on TV do it. Instead what I got was an egg lacking crab and corn mixture. I read that some trim the edges to attain the round shape but I consider it cheating. And there’s the egg rings. I found these in the grocery store and it looked like a foolproof way to finally have breakfast with a McDonalds-like perfection but right after I cracked the egg, all hopes were gone when the egg white leaked like water from the lower sides. 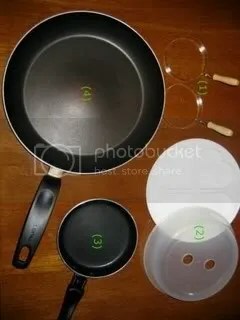 A smaller Teflon frying pan was my latest purchase hoping that its size will make the egg form along the pan’s side. At first it actually did but the top side does not cook well which led me eventually flip the egg and ruin its form in the process. With the outcome I have mentioned, I will continue my search for the sunny side up and hope that someday I’ll start my day with a lovely egg I could proudly say I personally cooked to complement the brewed coffee and bread or whatever goes well with it. Hopefully, that day will come before we welcome to our home a new family member or else I’ll be forced to serve him either scrambled or boiled eggs just because I can’t cook the perfect sunny side up. Anybody for an egg meet up?